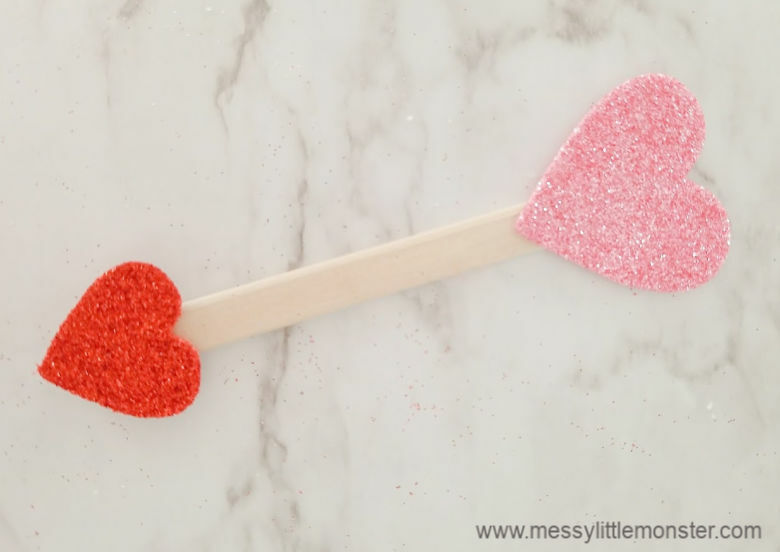 Cupid Arrow Heart Craft - The Easiest Valentine's Day Craft Ever! 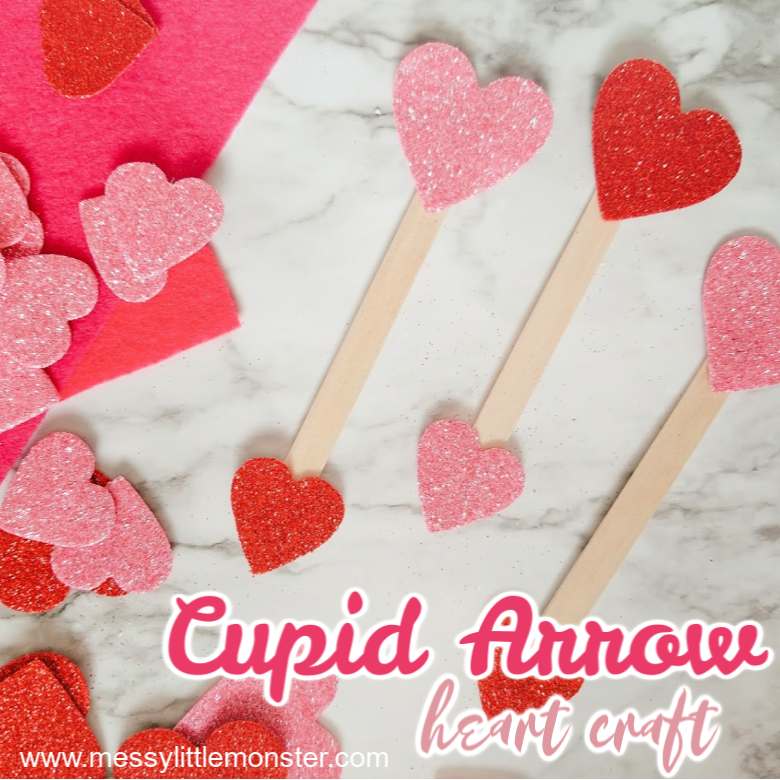 If you are looking for an easy heart craft for kids it doesn't get any easier than this cupid arrow craft! Using just a few craft supplies toddlers and preschoolers can easily make this heart craft to give to a loved one. Just scroll down below to see how to make a set of cupid's arrows. 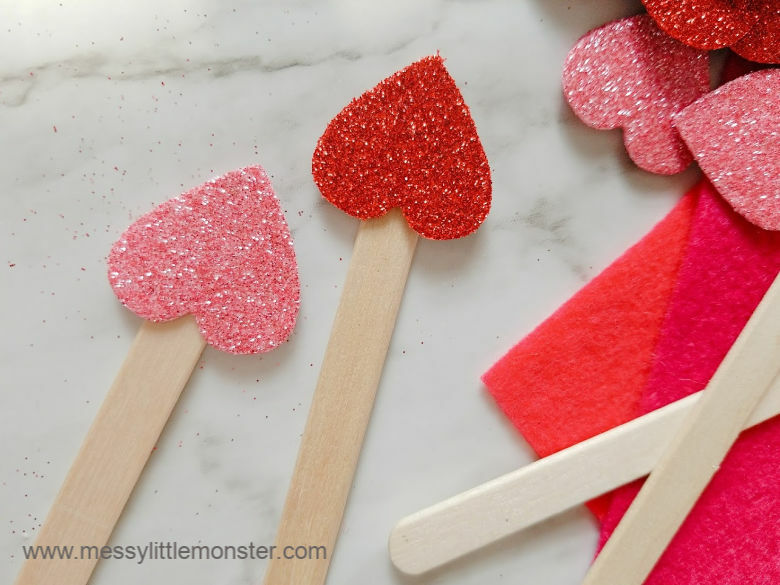 We love Valentine's Day crafts and have a whole collection of easy heart crafts for kids to take a look at. You will love our fingerprint heart and these heart magnets make cute little Valentine's Day gifts! 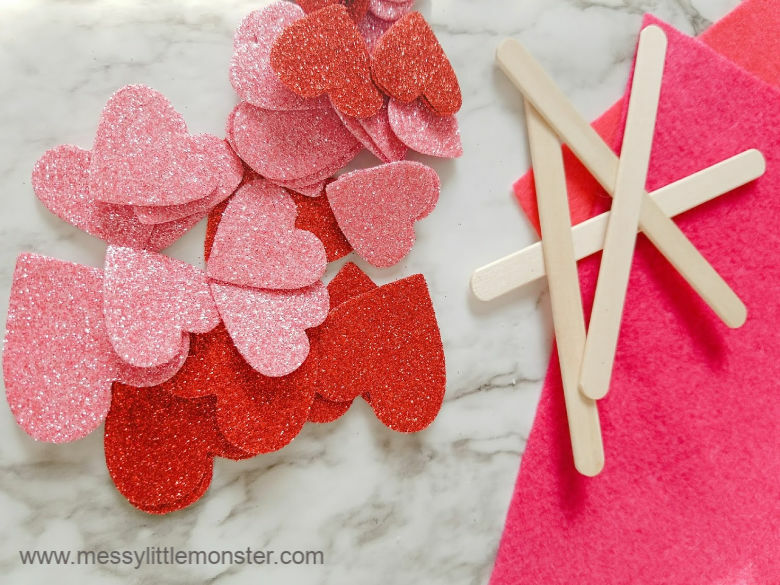 The cupid arrow craft that we are sharing today is super easy, which makes it the perfect Valentine's Day craft for toddlers and preschoolers. Why not set up a selection of the supplies listed below and invite little ones to create their own heart craft! You could set up a selection of different sized hearts in different colours to make it even more fun. 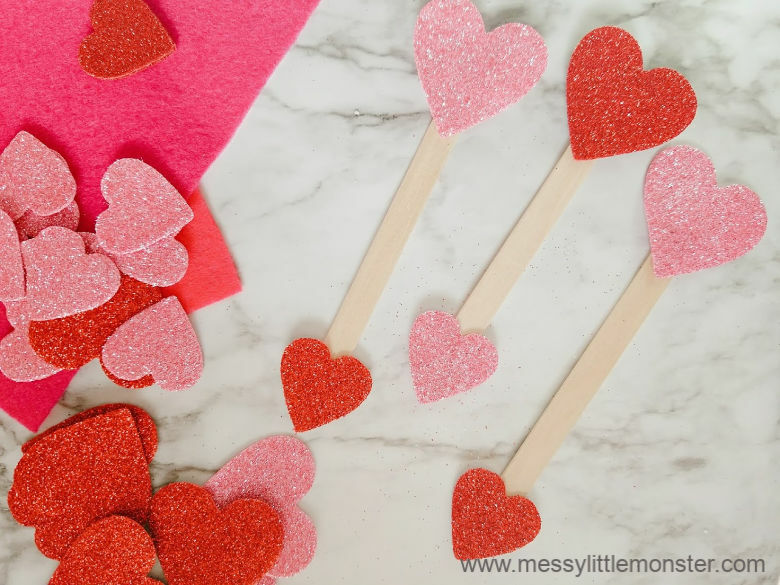 This would be a great Valentine's Day activity to do as part of a Valentine's Day themed playdate or at a toddler group. As this craft is aimed at toddlers and younger preschoolers it is super important to have all your supplies ready so they can get stuck in straight away. To keep this cupid arrow craft really easy we left our wood craft sticks natural, but you may choose to apply a couple of coats of craft paint to them prior to beginning. If you do paint them, be sure to allow the paint to dry well before proceeding. Add a dab of glue to the end of the wood craft stick. Apply one large heart to the end of the stick so the rounded end of the heart is placing outward. Hold in place and allow to dry. At the opposite end, glue a smaller heart. In this case, glue it in place so the pointy end is facing outward. Hold in place until dry. STEP 3: Display your cupid arrow craft or give it to a loved one! Once both hearts are glued securely into place, your Cupid’s Arrows are ready to be displayed! You could hang them from ribbon, attach them to a wreath, display them in a jar or give them to a loved one. 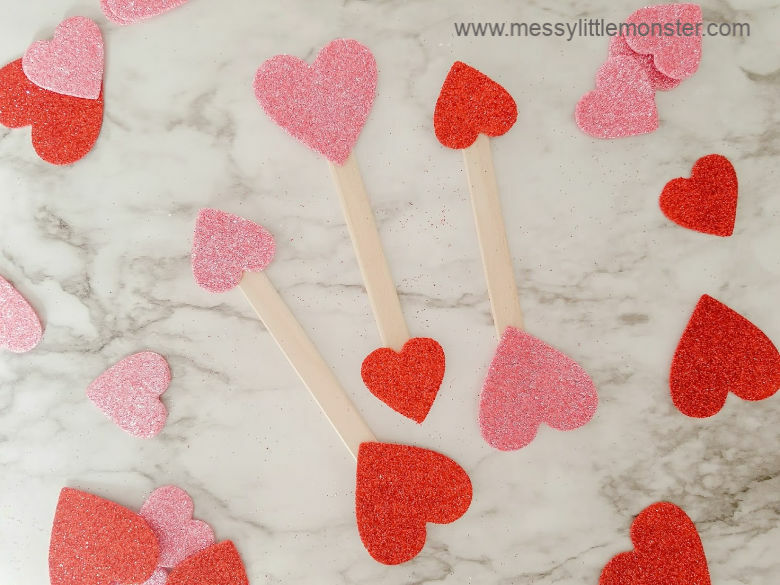 Toddlers and preschoolers would love to make a whole collection of cupid arrows! Provide a selection of different coloured and sized hearts to make it even more fun! 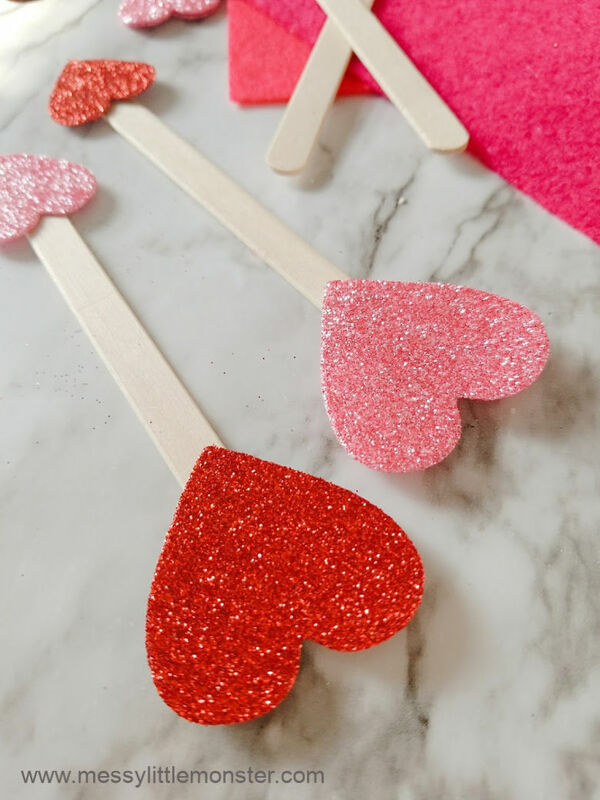 We love this adorable cupid arrow craft and it is an added bonus that it is a super easy Valentine's Day craft that uses very few supplies! We hope that your little ones enjoy making this fun and easy heart craft for toddlers and preschoolers.